WASHINGTON, D.C., Oct. 9, 2015 (SEND2PRESS NEWSWIRE) — On Saturday evening, October 24, 2015, best-selling author Vicky Moon will celebrate the release of her latest book, “The Stylish Life – Equestrian” (ISBN: 978-3832732639) with a book signing at the prestigious Washington International Horse Show (WIHS), presented by Blue Ribbon Events. The signing will occur at the President’s Cup Party at the Acela Club located in the Verizon Center in Washington, D.C., and is hosted by the Young Nelson Society of Washington. To purchase your ticket to this event, please click here: http://www.wihs.org/social-events/. 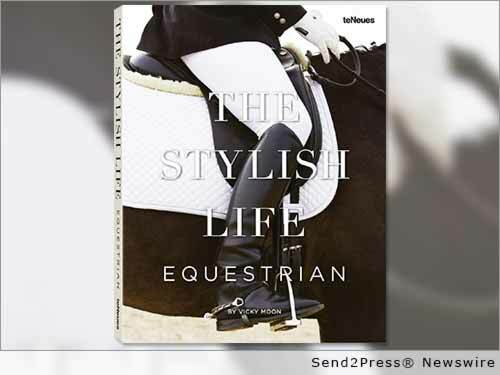 “The Stylish Life – Equestrian” is a coffee table book that offers an inside look at the refined world of international equestrian sports and culture. There are lavish images of royalty, socialites and fabulously-dressed spectators from Royal Ascot in England to Prix de l’Arc in Paris, to events in Buenos Aires, Melbourne, Beijing, and many others. Vicky Moon will also have a number of copies of her book “The Middleburg Mystique” for signing and purchase. Writer and photographer Vicky Moon has chronicled the lives of the rich, the not-so-rich, the famous, and the not-so-famous for more than 20 years. She has written about lavish parties, hunt balls, steeplechase races for People, The Washington Post, Town and Country, and Millionaire magazines. She has chronicled homes and gardens for Veranda and Southern Accents, has served as a contributing editor for House and Garden and writes a monthly column for Washington Life. Vicky Moon is the author of many titles including: “The Private Passion of Jackie Kennedy Onassis: Portrait of a Rider” and “Equestrian Style: Home Design, Couture, And Collections from the Eclectic to the Elegant,” “The Middleburg Mystique,” “The Official Middleburg Life Cookbook,” “Best-dressed Southern Salads” and “A Sunday Horse.” Vicky Moon divides her time between the nautical capital of Fort Lauderdale, Florida, known as the “Venice of America,” and the village of Middleburg, Virginia. To purchase your ticket to the President’s Cup Party visit http://www.wihs.org/social-events/. To purchase a general admission ticket to the Washington International Horse Show for that evening, visit http://www.wihs.org/tickets/. To learn more about Vicky Moon, you can visit her website at http://www.vickymoon.com/ where you can also order a copy of “The Stylish Life – Equestrian” directly. The purchase price of the book is $55. Original Keywords: ISBN 9783832732639, Washington International Horse Show, WIHS, Blue Ribbon Events, coffee table book, photography, Acela Club Verizon Center Vicky Moon Washington District of Columbia WASHINGTON, D.C.
Alternate Headline: Blue Ribbon Events announces Book Signing by Celebrated Equestrian Author Vicky Moon in Washington D.C.
REFERENCES: Books and Publishing News, ISBN 9783832732639, Washington International Horse Show, WIHS, Blue Ribbon Events, coffee table book, photography, Acela Club Verizon Center Vicky Moon Washington District of Columbia WASHINGTON, D.C.